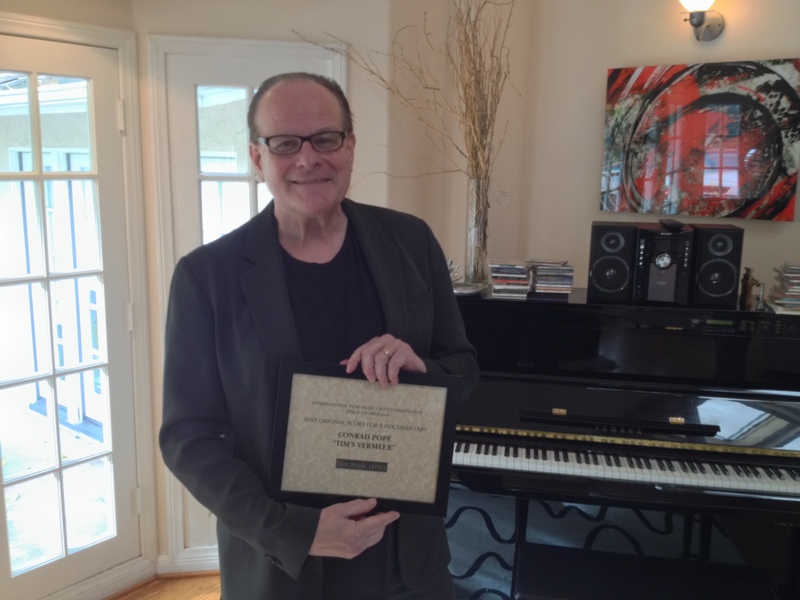 Composer Conrad Pope has been presented with the International Film Music Critics Association Award for Best Original Score for a Documentary by IFMCA members Jon Broxton and Craig Lysy, for his exquisite score for the artistic documentary Tim’s Vermeer. This is Pope’s first IFMCA nomination and win. The other nominees in the category this year were Mark Rayen Candasamy for Anne & Alet, Sarah Class for Africa, Oliver Heuss for Die Nordsee: Unser Meer, and Blake Neely for Space Shuttle Columbia: Mission of Hope. 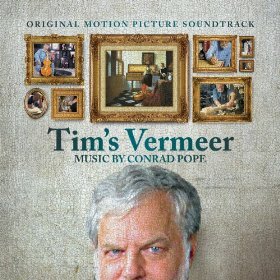 Tim’s Vermeer is a documentary film, directed by Raymond Teller (of the magical duo Penn & Teller), about inventor Tim Jenison’s efforts to duplicate the painting techniques of 17th century Dutch master artist Johannes Vermeer, in order to test his theory that Vermeer painted with the help of optical devices such as a camera obscura. Pope’s music for the film is a combination of rich classical influences capturing the essence of Vermeer’s talents, and some moments of more contemporary jazz, reflecting the life and work of Jenison, whose personal interest in Vermeer’s work initiated much of his professional research. 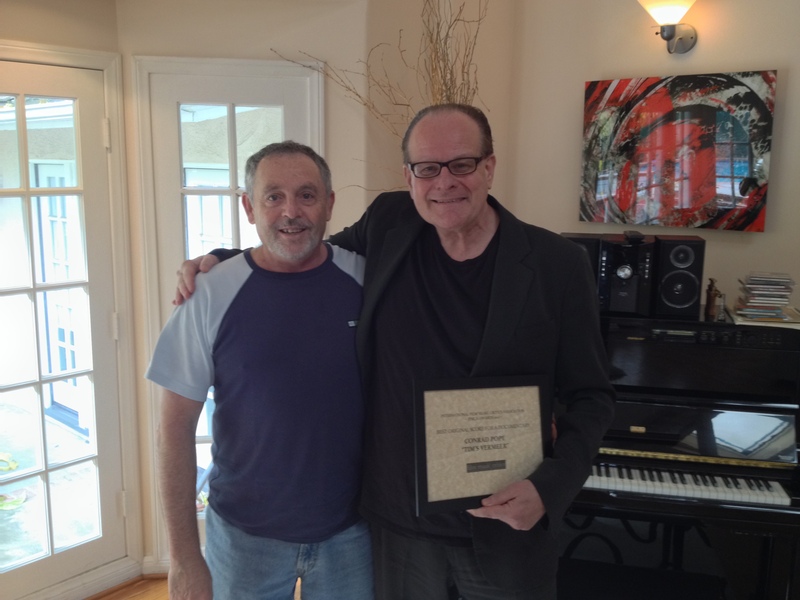 Conrad Pope has been one Hollywood’s most successful composers, conductors and orchestrators for over 20 years. After receiving the George Chadwick Medal, the school’s highest honor, upon his graduation from the New England Conservatory, Pope went on to study at Munich’s Hochschule für Musik, and at Tanglewood, before completing graduate studies at Princeton University. He made his film music debut composing for lower-budget genre films in the mid 1990s, but gained a great deal of acclaim for his scores for films such as Pavilion of Women (2001), The Rising Place (2001), The Presence (2010), and the critically lauded My Week With Marilyn (2011), prior to scoring Tim’s Vermeer in 2013. As an orchestrator and orchestrator, Pope has worked with virtually every major composer in Hollywood, on numerous blockbuster franchises. He has collaborated with John Williams on the Star Wars prequels, the Harry Potter franchise, Schindler’s List, Jurassic Park, Catch Me If You Can, and many others; with Hans Zimmer on Pirates of the Caribbean; with Alexandre Desplat on The Curious Case of Benjamin Button, Argo and Godzilla; with Don Davis on the Matrix franchise; with Mychael Danna on Life of Pi; with James Horner on Troy; with John Powell on X-Men: The Last Stand; with Danny Elfman on Sleepy Hollow; and many more besides. Most recently, Pope travelled to New Zealand to conduct and orchestrate Howard Shore’s music for the final two films in the Hobbit series, The Desolation of Smaug and The Battle of the Five Armies. In addition to his film work, Pope founded a concert series at the Boston Museum of Fine Arts, and staged a number of American premieres while Director of the Music Production Company, working with, among others, Sir Peter Maxwell Davies and Peter Sellars. In addition to regular performances in the United States, his work has garnered international attention: Pope’s “Sonata for Violoncello Alone” was the American entry in the Paris Biennale, for example, while Milan showcased his “Piano Variations” during its Musical Nel Nostro Tempo festival. 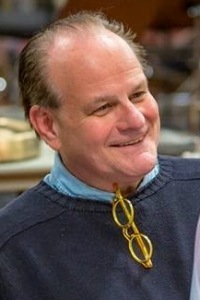 Pope’s “Summer Sketches,” commissioned by Hartt School of Music, Hartford, Connecticut appears regularly on orchestra concerts throughout the United States. In spring of 2006, the Spokane Symphony Orchestra and Eckart Preu, conductor, premiered Pope’s new orchestral work “Purple Prose,” greeted with standing ovation and critical acclaim. 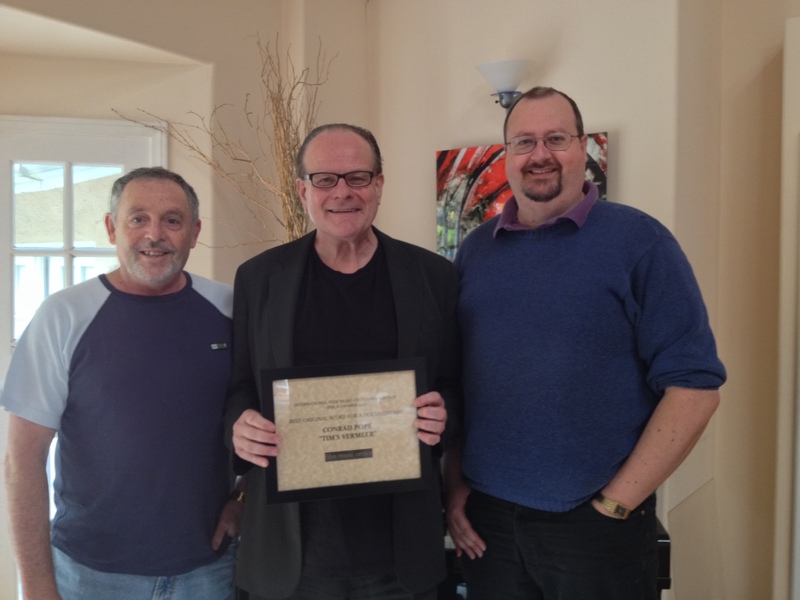 December 2010 saw the premiere of Conrad’s most recent concert work for orchestra commissioned by the Australian International Symphony Orchestra Institute at their festival in Hobart, Tasmania, Australia. Click here to see Pope’s acceptance speech, and hear some music from the Tim’s Vermeer score.